April 2017 has been declared Grange Month by National Grange President Betsy Huber. 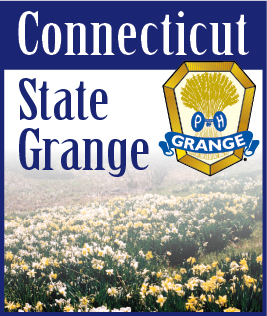 “Community Granges throughout Connecticut are encouraged to participate in the month-long celebration by opening their doors to the public for family-oriented events focused on the contributions of the Grange in their communities. Community Granges will be celebrating Grange Month with open houses, lectures and programs, citizens’ awards, service projects, community displays, traditional potluck suppers and more.” What is your Grange planning during for this April? The Grange Month theme for 2017 is “What Will We Do When the Do-ers Are Gone?” In other words, who will take your place when you are no longer able to volunteer and serve your Grange as you are now? This was unveiled at the National Grange Convention last November.